Hello everyone! It’s Judy here today with a Fabulous Canvas Flower card! I’ve used DODZ Adhesive Dots 3D to assemble the flower and give it dimension. DODZ Adhesive Dots Medium hold it onto the card. I’ve used E-Z Dots® Permanent Refillable Dispenser to fasten the papers together and 3D Foam Squares White Mix to pop up the circle. The canvas flower is die cut from canvas that I colored with Distress Oxide ink and misted with water. I love the irregular color! DODZ Adhesive Dots 3D hold each layer together and fasten the button. The circle of white cardstock has strips of pink check paper tape separated by narrow grosgrain ribbon. Home and Hobby Premium Double-Sided Tape ⅛ʺ holds the ribbon in place. I’ve stamped the verse with Hero Arts Birthday Messages stamp. The little black dots are made with Imagine Crafts/Tsukineko Neon Amplify! The circle is popped up with 3D Foam Squares White Mix of which I used the larger squares. 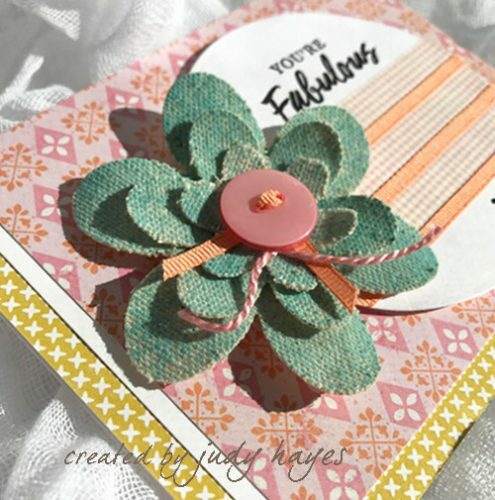 I love adding an element of texture to a card like this flower! Fun mix of colors and papers! Perfect for Mother’s Day too! This entry was posted in 3D Foam Squares, 3D Projects, Adhesive Dots & Lines, Adhesives, Canvas, Cards, Crafts & Tutorials, E-Z Runner® Dispensers, Permanent Adhesive and tagged 3D Foam Squares Mix White, Authentique Paper, Buttons Galore & More, Canvas Corp., E-Z Dots Permanent Refillable, Echo Park Paper Co., Hero Arts, HomeHobby by 3L, IMAGINE Crafts/Tsukineko, Judy Hayes, Mother's Day, Ranger Ink, Spellbinders Paper Arts. Bookmark the permalink.